Providing you the best range of tumbler drum with effective & timely delivery. End-over-end tumble mixing in 55-gallon steel drums is a rapid, effective and economical method for mixing or blending wet and/or dry materials. Single and double drum designs with constant or variable speed drives. 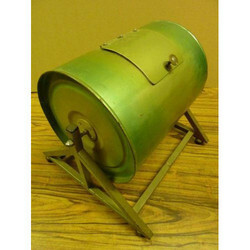 "Removable drum" design permits mixing in suppliers' drums; eliminates loading, unloading, cleaning of fixed containers. One tumbling unit can be used for varied materials, colors, etc., by using additional drums. Heavy welded steel plate construction provides maintenance-free service, shock-resistance, rigidity. Drum holder opens quickly, easily, locks securely. On variable speed machines, speeds can be changed while unit is operating. Looking for Tumbler Drum ?